SPINN with judges Shila Nathan (NASH FM 94.7 midday host) and Jesse Addy (NASH FM 94.7 afternoon drive host) (FAR LEFT), listener judge George Barker, Bill Evans (Senior Meteorologist WABC-TV), and Mike Allan (Assistant Program Director, NASH FM 94.7). 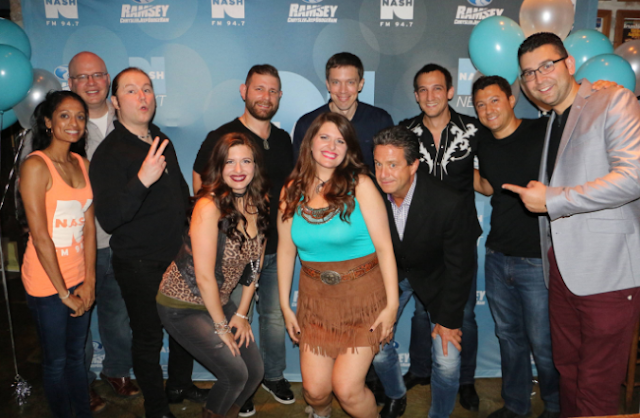 Cumulus Meida's WNSH Nash 94.7 FM has announced that local country duo SPINN won the NASH NEXT 2016 Country Challenge Showcase live country music talent competition held on September 14th at Hill Country Barbecue Market in New York City. SPINN was one of eight area country artists that performed an original song in the live challenge event that is the next step to stardom for participants in Cumulus’ NASH Next 2016 national country music talent competition. The artists were selected to perform through two previous challenge rounds. The WNSH judging team, comprised of NASH FM 94.7 on-air personalities Shila Nathan and Jesse Addy, Assistant Program Director Mike Allan, Senior Meteorologist for Eyewitness News and WABC TV Channel 7 Bill Evans, and a station listener selected the area semi-finalist at the culmination of the live music competition. SPINN, who won over the judges and crowd with their performance of “City Country” will advance as a semi-finalist to the national NASH Next 2016 video competition, held this fall. SPINN is an Alternative Country Duo made up of twin singer/songwriters Stephanie and Cheryl Lynn Spinner. Their style, which they call "City Country" is a blend of their life-long love for country music and experience growing up right outside New York City. 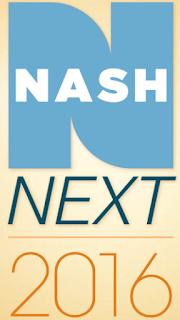 A total of 68 NASH/Cumulus stations in 60 markets, including Dallas, New York, Atlanta, Detroit and Nashville, have conducted extensive local talent searches for the past two months, with additional national participation made possible by Cumulus’ digital properties and syndicated country shows. The winner of this four-month-long national competition, announced by country legend Reba McEntire, will receive a record deal with Big Machine Label Group, home to such superstars as Taylor Swift and Tim McGraw, as well as substantial exposure, commensurate with a major label release, on Cumulus radio stations nationwide. While television boasts several talent competitions, no other contest -- on any platform -- has ever offered its winners a similar opportunity for coveted radio play, which is the most effective medium to cultivate an artist and propel a major music career. Finalists, and the 2016 winner, will be selected by a panel of country luminaries, including Scott Borchetta, founder, president and CEO of Big Machine Label Group, the world’s #1 independent record label, Kix Brooks, half of Brooks & Dunn, one of country music’s most successful duos of all time, Jay DeMarcus of chart-toppers Rascal Flatts, and Danielle Bradbery, Season 4 Winner of The Voice, joined by a Cumulus listener.